← Mormonism: Monastic, or Pragmatic? Sure, Communism is evil. But like many of Satan’s “glass imitations,” it has some powerful truths mixed with its errors, and Mormons share many of those same truths. These similarities might make us uncomfortable, given Communism’s terrible reputation. It’s tempting to casually dismiss Communism as “Satan’s plan,” while ignoring the many similarities between it and the Law of Consecration. We often dodge the issue by claiming that the Law of Consecration was not forced upon people as Communism was, and that makes all the difference, since in Satan’s plan, there is no free-agency. But I’d like to take a closer look at the similarities and differences between Communism and Mormonism, with the intent of understanding both traditions in a more nuanced way. Before Communism became authoritarian, it was a grassroots collective of millions of zealous adherents, recruited in the same way any religion gains recruits. It’s converts had tremendous passion, evangelical zeal, and absolute obedience. The faith of early Communists rival the faith of our early saints and martyrs. They were incredibly hard workers. Work itself was the supreme value, their first article of faith. They believed they were part of a revolution, a new world order that would require incredible sacrifice, discipline, and endurance. They would have been shocked and dismayed to hear that their cause would later be associated with free handouts and collective lethargy. For the first decades of Communism, its numbers grew not out of compulsion but out of individual free will and the courageous commitment to it’s cause in the face of great opposition. The doctrine and practices of early Communism are similar to those of Zion and the millennium: no poor among them, all things in common, faith, obedience, loyalty, education, unity, industry, progress, and above all, the dignity and worth of the individual, the lost sheep, the least among us. 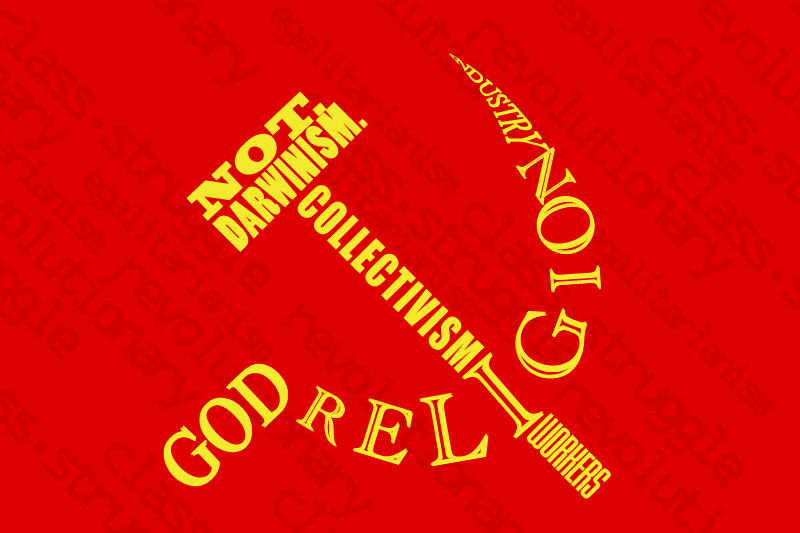 Both Zion and the Communists valued traditional morality: anti-adultery, pro-family, etc. In both ideologies, pure doctrine was tightly controlled and overseen. Over time, in both traditions, complicated doctrines and theories were simplified so as to appeal to the masses and be understood by all. In both ideologies, children are the most important of all: the rising generation is the greatest ever. Children are the future! The simple and pure nature of Communist and LDS doctrine could be understood and articulated out of the mouth of babes. As in Zion, early Communists had their prophets, their scriptures, their tracts and literature, testimony meetings to inspire obedience and faithfulness to the cause, their call to evangelize political action to pursue their righteous causes. And while consecration was not forced upon the LDS people in communities where it was practiced, people who didn’t practice it were still subject to chastisement in the form of revelations from the prophet, if they did not obey. Most of all, there was the absolute knowledge that this was best way, the only way. All other ideologies were corrupt and apostate. represented new freedoms and opportunities for them. Once this happened, Communists assumed that people would naturally work hard and be industrious, collectively believing in a new world of progress and prosperity for all. and righteous, not out of compulsion, but of their own free will. no longer present, people will naturally be righteous. Communists didn’t expect that their revolution would cause widespread bloodshed and decades of economic depression and eventual ruin. it, so they became seen as murderers and criminals. But that doesn’t mean that they didn’t do start out with the most righteous and pure of intentions. probably, I would have been a diligent young Communist at that age, were that the culture I was born into. Hopefully, I would have stopped as soon as it became clear that the bloodshed and revolution would never cease, but I can’t be sure. It would depend on how strong my faith in the cause was. The fact that we have our own Mountain Meadow Massacre, is reason enough to question the power of our own faith and determination, when venturing out onto thinner and thinner ice. modern ideas about science and true religion being compatible. Ultimately however, the rejection of God was probably the greatest mistake of Communism. They were unable to see how closely Communism’s own values resembled true Christianity. Had the founders of Communism accepted God and religion, it might have saved them from blood and horror, and found a more workable and enduring form. Capitalism, moderating and taming it’s more base instincts. This combination of Christian values, with the powerful social instincts of Capitalism, have made it the greatest and most prosperous form of government ever known to man. Capitalist government. I believe that understanding the roots and initial similarities of both our traditions can help us see our current political situation in a more nuanced light, leading to greater understanding and progress. I agree with this. It is good ethics and our willingness to bind ourselves to them that is the greatest agent for good.